UNITED NATIONS, Sep 15 2017 (IPS) - On 23rd August, just days before thousands of Rohingyas began fleeing their homes from Rakhine State, Aung San Suu Kyi’s recently appointed Rakhine Advisory Commission, established in 2016, submitted its final report. The engaging of an independent Commission, tasked with recommending newer ways of improving the lives of Rohingya Muslims, Myanmar’s most deeply persecuted minority group, carried some weight of diplomacy. In that week, when clashes broke out between Rohingya militants and security forces, Myanmar’s Army responded by doubling down on its attacks against Rohingyas in Rakhine State, killing at least 400 people, only 29 of whom were militants. What appeared as a window of opportunity to test the findings of the report, which recommended reviewing a citizenship law that revoked the rights of Rohingyas as citizens of Myanmar in 1982, collapsed at its feet. 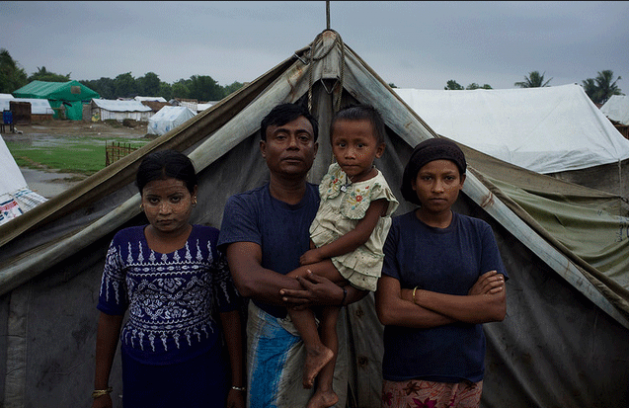 Instead, a record numbers of Rohingyas, more than 300,000, were forced to flee to Bangladesh. This recent wave of violence, is in many ways, both old and new. In 1977, when Burmese authorities conducted a set of screenings, called Operation Nagamin (Dragon King), to register its citizens for a national census, almost 200,000 Rohingyas were forced to flee. Although authorities claimed that it was simply screening out foreigners, refugees who primarily fled to Bangladesh, and who were largely Rohingya Muslims, disputed the claims and alleged widespread police brutality. Similarly, this February, four months after a group of Rohingya militants broke into prominence by killing nine police officers in October 2016, the UN released its first findings of the long standing conflict, laying bear the horrific killings, gang rapes, and “crimes against humanity” committed by the State’s military in it’s retaliation to the attack. IPS spoke to Matthew Smith, an expert on the topic, and the co-founder of Fortify Rights, an NGO that vigilantly documents human rights violations in Southeast Asia, about the rise of armed insurgencies staged by a group of Rohingya militants. The group, called the Arakan Rohingya Salvation Army (ARSA), is relatively small. Believed to have been backed by donors in the Middle East, the group wields its sense of power from the support of its community. When Matthew spoke with fighters of ARSA; he explained that, militants who have carried out its most recent attacks by using knives and home-made bombs, were acting on the promise of being aided with more automatic weapons, and newer fighters. However, when that plan failed, Myanmar fell into the hands of the Army. ARSA was no match to the military’s prowess. ARSA fighters, many of whom partially blame themselves for the cataclysmic turn of events, first picked up ammunition to break away from this very sense of helplessness. For them, there was simply no other option. Inadvertently, a combination of threats posed by ARSA and a public maneuvering by a government long prejudiced against Rohingyas, gave way to support for the military among Burmese citizens. Most citizens, who otherwise remain very skeptical about the military’s role in domestic politics, found new ground with the army to quash any militant threats. A renewed sense of public consensus that backed the government’s strategy of driving out Rohingya from the country pushed into maximum effect in the last few weeks. In spite of international pressure to rein in violence, Aung San Suu Kyi is walking on a tightrope, and is keeping silent, for now.